The most popular of Italian wines, Pinot Grigio can be more than a simple summertime quaffer. Americans love Pinot Grigio. Light, refreshing, and easily pronounceable, it has topped the charts in recent years as the best-selling type of imported table wine. That’s not bad for a grape variety introduced to the U.S. only 30 years ago. In 1977, Cavit imported the first bottle, followed by Santa Margherita in 1980. Since then, it’s become a staple in wine shops and restaurants, often edging out Sauvignon Blanc in popularity and even giving Chardonnay a run for the money, especially in the hot summer months, when fresh and zippy holds more appeal than alcoholic and oaky. Trouble is, Pinot Grigio can frequently be thin, insipid, and uninspiring. A writer in Wine Enthusiast dubbed it “the light beer of wine,” while wine critic Janice Robinson observed, “Pinot Grigio is a name associated with tart Italian whites of virtually no flavour or colour, and occasionally just a whiff of paint-stripper.” The trustworthy folks at my local wine shop admitted to steering customers away from Pinot Grigio. “There are so many better whites at that price point,” said the owner about the under-$10 bulk versions. Could Pinot Grigio be anything more than just an inoffensive summertime quaffer, a Bud Light for the newly emerged wine masses? Were there any really good ones? I made it my mission to find out. As its name implies (grigio means grey), the grapes can be grey-blue, but also green, golden yellow, or pinkish gray—sometimes in the same cluster. It was promising to know that Pinot Grigio comes from noble stock. A sibling of Pinot Noir, it was born in Burgundy, the offspring of the original Pinot prototype and an obscure grape called Gouais Blanc, according to genetic research by Carol Meredith at UC Davis. Pinot Grigio made its way to Switzerland in the Middle Ages, then to Germany and Alsace by the 1500s, then to northeastern Italy—specifically Alto Adige, Friuli, and the Veneto. Unlike its white sibling Pinot Bianco, Pinot Grigio has colored skin. As its name implies (grigio means grey), the grapes can be grey-blue, but also green, golden yellow, or pinkish gray—sometimes in the same cluster. When vinified with the skins, the wine can appear golden or slightly copper (a style known as ramato, or copper colored, in Italian). 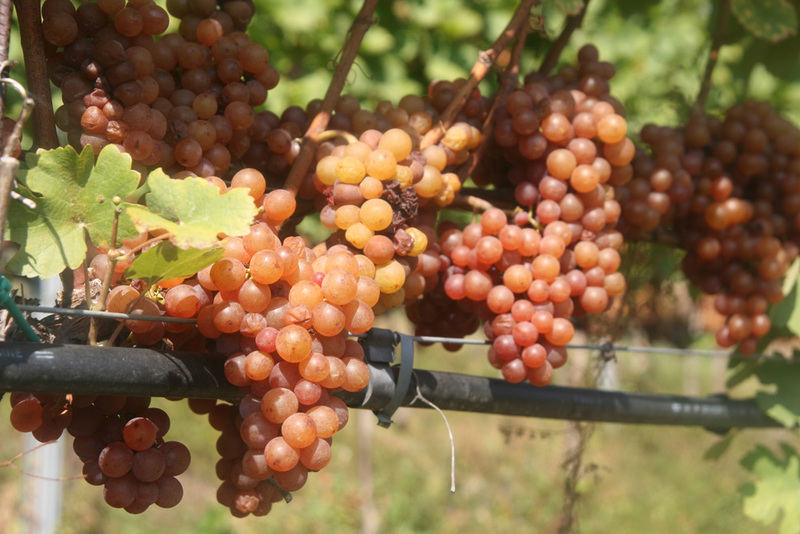 Pinot Grigio is genetically identical to Pinot Gris, but stylistically different. Pinot Gris tends to be creamy and honeyed in Alsace and Germany, where semi-dry botrytized versions are not uncommon, and more fruit-forward in Oregon. Pinot Grigio from Italy is crisp and bone dry, with a delicate bouquet of golden apple and pear, a touch of citrus, and some minerality on the palate. It was Italy’s Pinot Grigio that Americans first knew, and bulk versions like Cavit, Bolla, and MezzaCorona still dominate the market. The slightly more upscale Santa Margherita has its loyal following, no doubt helped by heavy advertising. “People ask for it by name,” confirms Lydia Serrano, wine buyer at Beacon Wines in Manhattan. “But people are branching out, which is why we carry a good selection of other Pinot Grigios.” Indeed, Beacon offers bottlings by Jermann, Livio Felluga, St. Michael-Eppan and other boutique labels run by winemaker-craftsmen resolutely determined to get the most out of this grape. The alpine turf of Alto Adige pinot grigio, here near Lake Caldaro. The best price/value pinot grigio of the lot. Tasted side by side, it was apparent winemakers are experimenting with different expressions of Pinot Grigio. Vie di Romans is aged in French oak barrique, making it a nice alternative for California Chardonnay fans. Lis Neris and Schiopetto are striving for creamy, more opulent versions, using old vines, barrel fermentation, and/or aging on the yeast. Though delicious, my preference lay in the versions that let Pinot Grigio’s delicate fruit and zippy citrus-lime really sing: wines like Tiefenbrunner’s $14 Pinot Grigio delle Venezie (the best price-value ratio) and Abbazia di Novacella’s excellent Pinot Grigio Stiftskellerei Neustift, my favorite of the lot, thanks to its wet-stone minerality. Notably, both are from Alto Adige, an alpine region known for aromatic, mineral-inflected whites. Happily, good Pinot Grigios really do exist. Though the grape’s charms are simple, the best versions are as enchanting as a summer breeze. Published in the winter 2008 issue of Tastes of Italia magazine.